Welcome to a summary of the students and research activities of Dr Raywat Deonandan’s scientific research program. Email me at the address below or use the contact form. 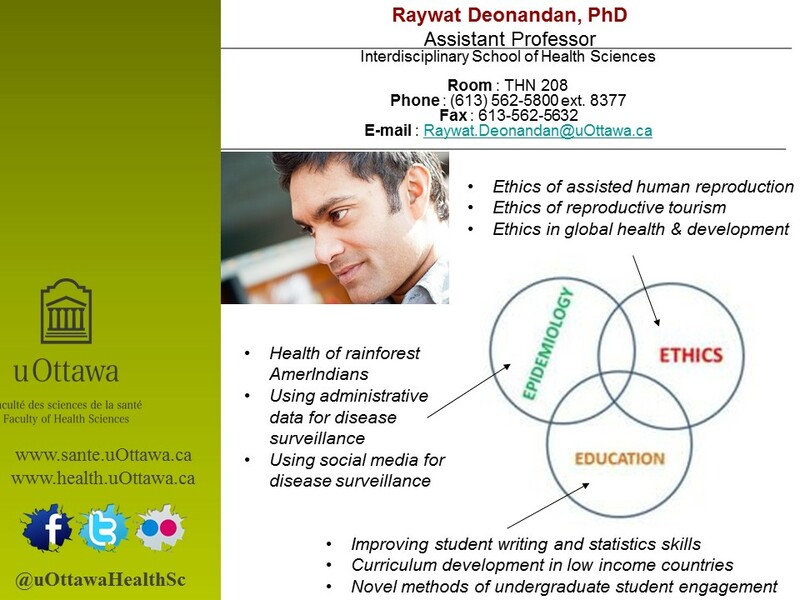 Dr Deonandan’s work concerns the intersection between the “three E’s” of Ethics, Epidemiology and Education. Check out photos of past and present students on the Flickr page. Asha Gajaria was a student in the M.Sc. program in Health Systems. Her thesis title is “Patient and provider expectations in healthcare: An qualitative analysis of patient satisfaction data.” She was co-supervised by Dr Wojtek Michalowski. Asha successfully defended her thesis in December, 2013. Elena Yammine was a student in the M.Sc. program in Interdisciplinary Health Sciences. Elena’s thesis title was, “Factors Associated With Employment For Graduates of Canadian Health Sciences Undergraduate University Programs.” Elena successfully defended her thesis in June, 2016. Ashley Weeks was a student in the M.Sc. program in Interdisciplinary Health Sciences, co-supervised by Dr Kristi Adamo. Ashley’s thesis title was, “Weight Gain Counselling in Prenatal Care:”Assessing and Improving Patient-Healthcare Provider Interactions.” Ashley successfully defended her thesis on Nov 19, 2018. Morgann Reid was a student in the M.Sc. program in Health Systems, co-supervised by Dr Craig Kuziemsky and Dr Michelle Lem. Morgann’s thesis title was, “Describing the rabies management system in an Ontario municipality: A mixed methods study of human and companion animal health outcomes.” Morgann successfully defended her thesis on Oct 29, 2018., and her work was nominated for an award by the examination committee. Metasebia (Metty) Afework Assefa was a student in the M.Sc. program in Interdisciplinary Health Sciences. Her thesis title was, “Evaluating a Nurse-Led Chronic Pain Self-Management Program.” Metty successfully defended her thesis on March 26, 2019. 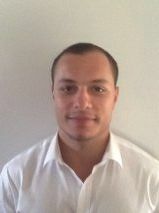 Louay Khir is a student in the M.Sc. program in Health Systems. He is co-supervised by Dr Craig Kuziemsky. Hannah Rivkin is a student in the M.Sc. program in Interdisciplinary Health Sciences. Nicholas de Billy The frequency and nutritional quality of food and beverage marketing viewed by children in gaming applications on mobile devices. Clemence Ongolo-Zogo Critical Research to Advance Infant Feeding (CRAIF): Infant feeding among Black women living with HIV. Community based participatory research. Gabby Dupuis Are Facebook Suicide Memorial Pages in Compliance with WHO Suicide Prevention Guidelines? Arthi Vasantharoopan Civil strife in Sri Lanka: breeding ground for a Dengue Fever epidemic?